Kath Tait told us that John used to live at Ladybrook, he was a friend of her brother Dean Humphries and Eric Mace – they were all mates. 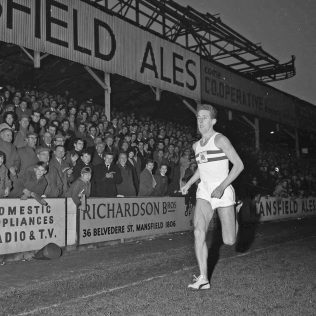 John was known to them as ‘Flog’ and Kath recalled how they would see him in races on TV and they would all be shouting ‘Come on Flog.’ Peter Green, recollected that John taught at Sherwood Hall School. David Clay wrote ‘I have lived in Forest Town for 23 years but originally came from Ladybrook, and lived next door to John Whetton and his family. When he competed in events he would sign and give me his runner number card, (unfortunately they have been lost over the years). When he did his training he would often take me on his Triumph motorcycle with me on pillion held on to him with a belt. I have a couple of photos of me with him on the back garden. 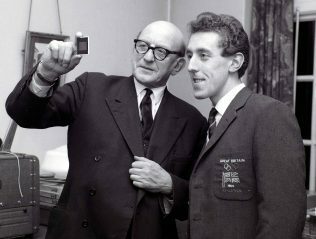 When he competed in Tokyo [1964 ] we all went to his house in Ravenshead to watch the final and were disappointed when he didn’t win. 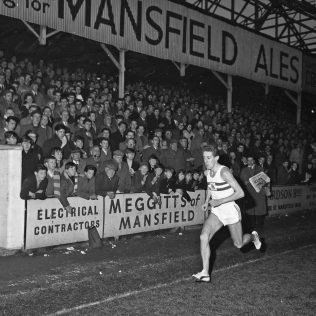 I can remember when he came back he did a lap of the pitch at Field Mill at one of the matches. 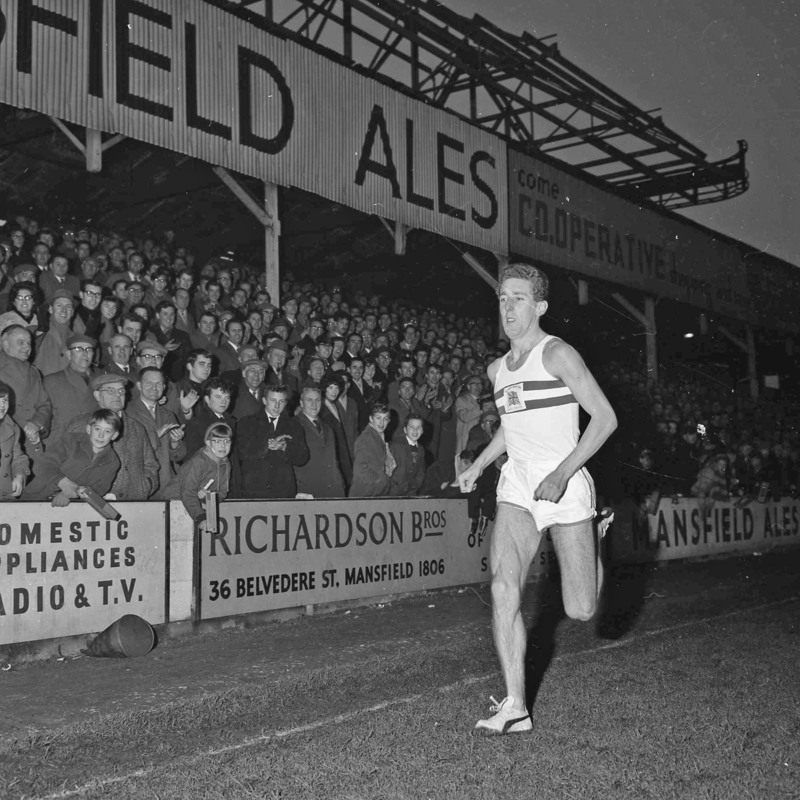 Not long after, there was an event at the Sutton Harriers track on Sutton Road and I can remember him coming home with Lyn Davis who won the long jump and he brought them round to our house to meet us . September 2005 Issue 26 pg 4 – below is an extract from John’s letter that was published. ‘A fisherman friend of mine has passed on to me a cutting of a letter by David Clay published in the March edition of The Forest Town Crier, a publication I never knew existed. David enquires of my welfare and whereabouts and describes some of the memories he has of my athletics career. I was delighted that some old neighbour of mine might take the trouble and possible courage to write in such a complimentary way and for that I feel greatly honoured. I do not live a million miles from Forest Town. Having taken slightly early retirement from a long-term lecturing post at Nottingham Trent University, I am now a man of leisure but still living life to the full and enjoying the pursuit of my personal hobbies and other interests. I still enjoy the freedom of running across nature’s fields albeit not with the frequency or intensity for which most people remember me some three to four decades ago. My prowess at running provided me with enormous benefits and my successes gave pleasure to many. My pursuit of excellence did not come easy and there were many moments of self-doubt, multiple experiences of agony and tears and countless frustrations. However, just as in the story my father often related to me as a bedtime duty, that of Robert Bruce and the indefatigable spider hell bent on escaping from his prison cell barred window despite a multitude of falls from the wall, I never gave up. The moral of that story has remained indelibly scored on my mind: “If at first you do not succeed, try, try again”. 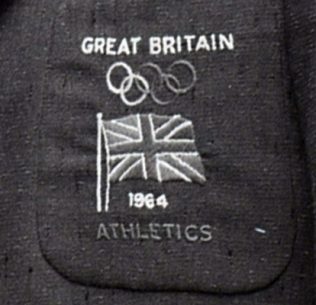 We are now within weeks of the opening of the 2012 London Olympics, and because of the media we can take pride in our local athletes who are participating. It is also an opportunity of looking back and making sure that we do not forget the name of a former local athlete who we should still be proud of. John Whetton will open the Museum’s exhibition ‘On The Right Track’ on Saturday July 7th. 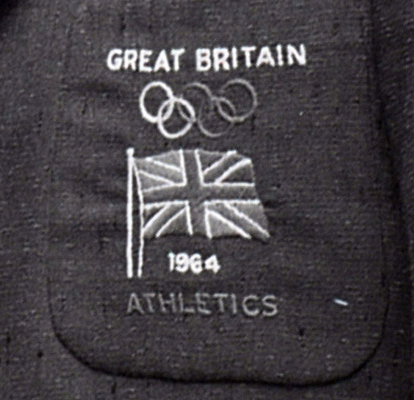 The exhibition will feature some of Johns memorabilia and his Olympic Blazers. Pauline Marples (Local Historian and former editor of the Forest Town Crier Community Newspaper). I remember John Whetton as he stayed with my mum and dad ( Tom and Sylvia Rowlands)in Mountain Ash when he competed in the Nos Galon Races on New Years Eve. He also took mine and my sisters autograph books to the Tokyo olympics and was lucky enough to acquire Mohammed Ali’s signature! I hope he is keeping well. John Whetton was two or three years my senior at Brunts Grammar School in the late fifties/early sixties. Remember him running like the wind on a school sports day! And again at some event at Berry Hill. Regards, Lionel. Is this the same John Whetton who attended Broomhill Junior School in the early 50s? He certainly looks like the J. W. who, I’m sure, was in my class, 3A1 or 4A1, and was known by some as “Wetneck” not for any specific reason other than the usual juvenile Mansfield corruption of a name. I remember John Whetton working at Dixie Grammar School, Market Bosworth, where I was a pupil in the 60’s. He must have been a student teacher. He taught me to throw a discus and I have nver forgotten him!